Celebrating all American small town spirit. The independence day parade! The spirit of small town America comes alive in our tiny town. You'd think we were way more than 25,000 people here... because we all come out, we all show up and we all celebrate together. The July 4 parade in Hood River, OR - celebrating our independence! Speaking of Go, yes that's a GoPro... video coming soon. 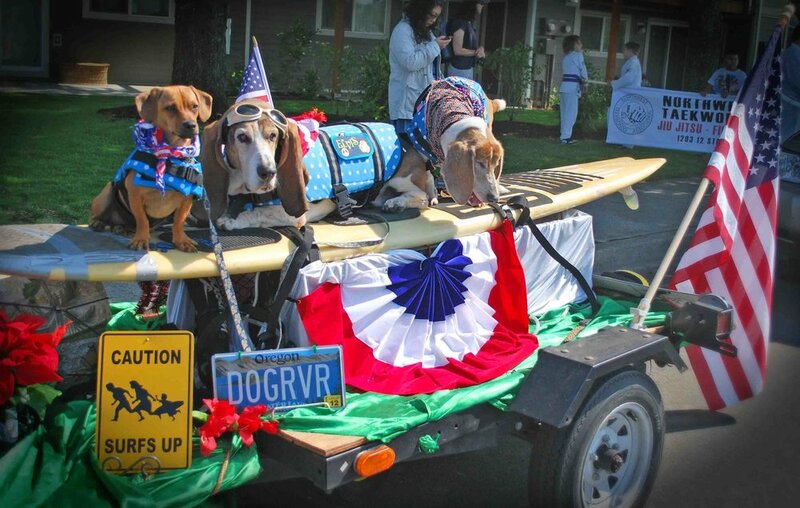 At SurfDogDiaries, our first parade was in 1991, with my first surf dog, Howdy, on a surfboard in the Ocean Beach Christmas parade... marching with the OB Geriatric Precision Surfboard Drill Team. OB had/has a total small beach town vibe. 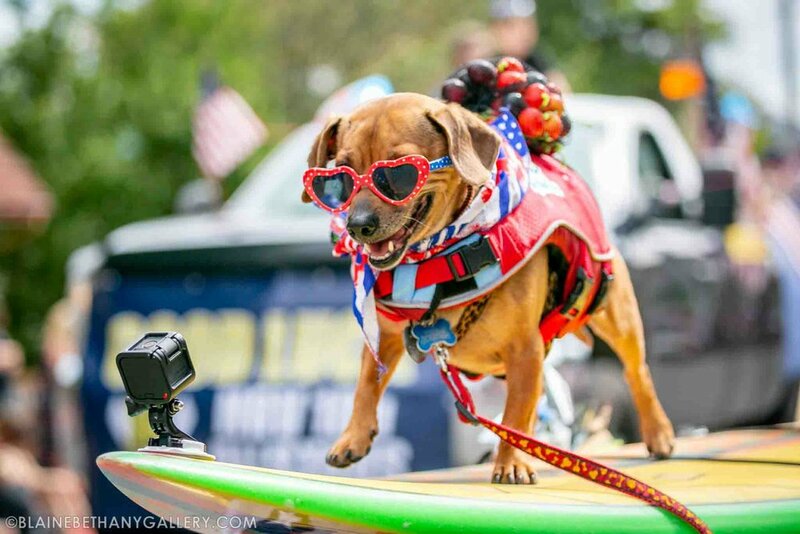 Howdy and I marched in red, white and blue, supporting our home beach - Dog Beach in Ocean Beach, where we held events to fix up the beach, and started dog surfing. Everyone but Elvis was named after Howdy Doody, the #1 surf dog. Elvis was always just Elvis. Dogs on parade continued after we moved to Oregon, where they redefine the term small town spirit. Our home beach changed from Ocean Beach's Dog Beach to Hood River's Dog River more than a decade ago. About celebrating independence.... and the spirit of adventure.... Oregon goes off. Ever heard of the Oregon Trail? Lewis & Clark? Pacific Crest Trail? Celebrating life - together with neighbors and family and friends - is what parades are all about. Welcome back SUMMER, old friend!